This article will show you how to convert Outlook .msg files to .eml files. If you have Microsoft Outlook for Windows, you can open an .msg file by clicking on it. Because .msg files are a format that is proprietary to Microsoft, you may want to bulk convert Outlook .msg files to .eml files. .Eml files are an open format supported by other email clients. EmlViewer Pro is a handy tool for managing and converting email content. It can read both .msg and .eml files, as well as Outlook .pst, .ost and .mbox files. 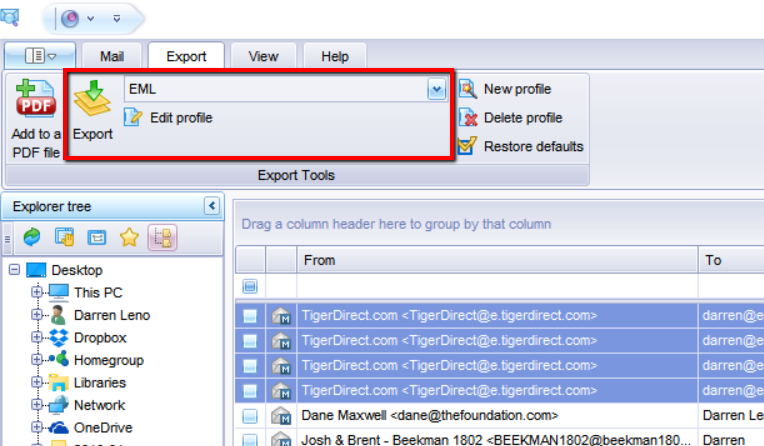 While Outlook can open individual .msg files when you click on them, it does not search or organize .msg or .eml files. EmlViewer Pro is useful for reading in a folder with hundreds or thousands of .msg or .eml files, searching them, and also exporting them to different formats. Download a free trial of EmlViewer Pro (also known as PstViewer Pro) and follow along with us. When EmlViewer Pro starts, use the explorer view in the left column to select the folder containing your .msg email files. The .msg files will be read into EmlViewer Pro. An .msg file can be recognized by the small “M” email icon in the mail list. .Msg Files in the EmlViewer Pro mail list. Use EmlViewer Pro’s search feature to identify the .msg files you want to convert to .eml. To select an email, highlight it in the list by clicking on it. You can hold the control key and select multiple .msg emails for conversion. To select all emails in the list, type control-A. Now that the .msg files have been selected, click on the “Export” tab. From the dropdown list, select “Eml” export profile and then click on the “Export” button. EmlViewer Pro will now begin converting the selected files from Msg to Eml format. When the process is complete, you can use EmlViewer Pro to select the folder where your new .eml files reside, and they will be read into the mail list. Converting .msg to .eml emails is easy with EmlViewer Pro. 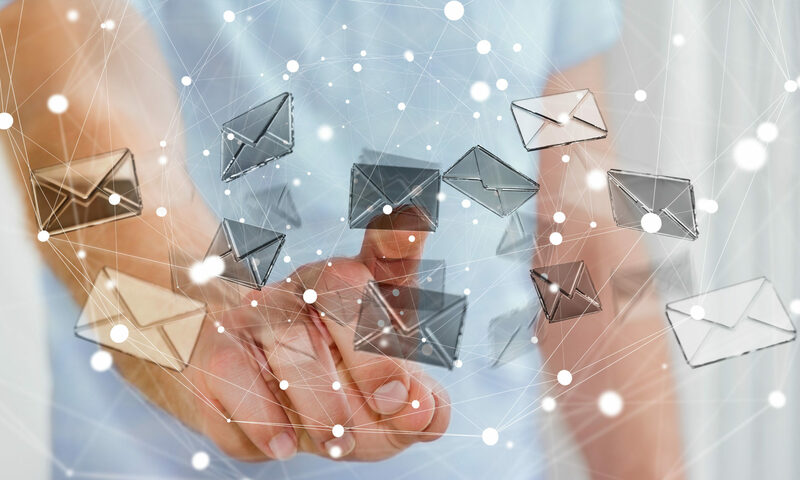 If you have any questions, please post them in the comments, or email us at supportline at encryptomatic.com, or call us at +1-651-815-4902 x2. Previous PostPrevious How to Convert EML Files to PDF? 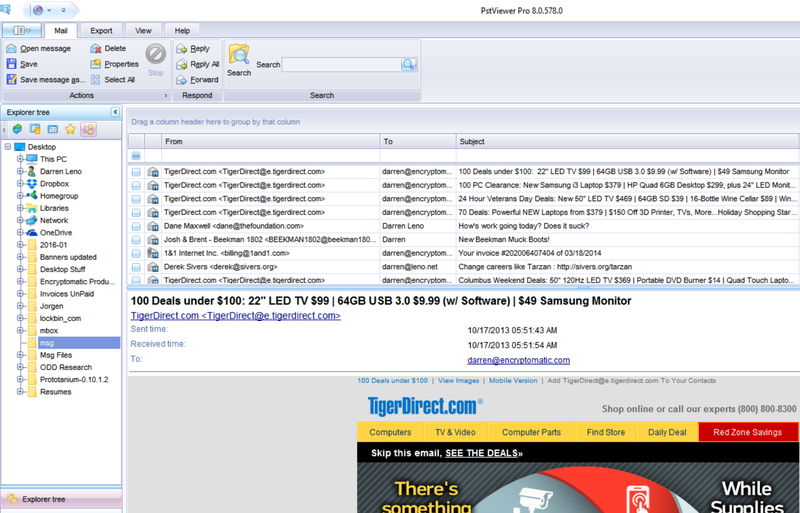 Next PostNext Converting Emails from .EML to .HTML Files.